Wonders never cease 🙂 He does have good taste though, don’t you think? 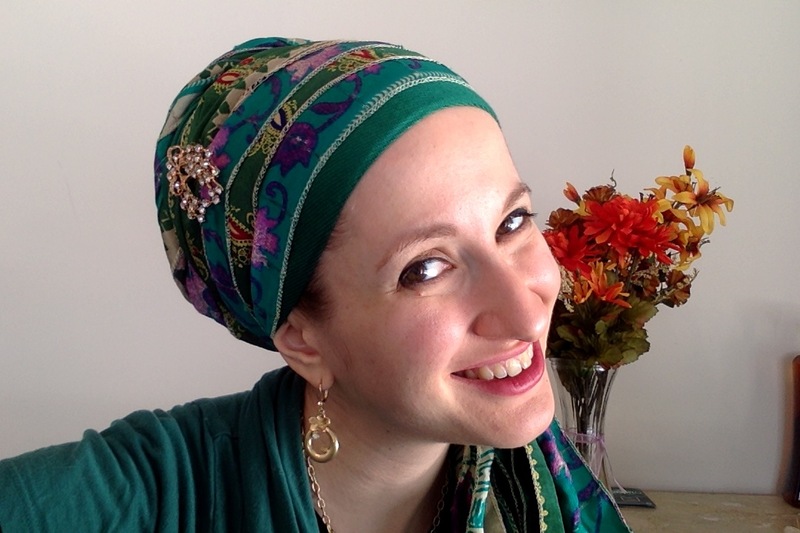 I was so happy with my Shabbat tichel that I wore it on Friday night AND Saturday during the day! I don’t know why I’ve never tried putting the white shimmery and white shinylicious together before… they were made for each other! And of course I couldn’t help adding some lace to top it off! I only realized later that the dark red and white colours (that’s right, it’s coloUrs :P) made me look very Canadian. I’m not one to tout my nationality, but it definitely made me smile! For those that are wondering… I do attempt to wear white on Shabbat when I can. My husband wears all white (yes, even the shoes!) so it’s sometimes a challenge to keep up, but I at least don’t wear black on Shabbat. The white reminds us that on this day we are elevated, ethereal, and closer to the infinite than during the week. I must admit, that wearing white tichels and clothing truly reminds me of this, and I hope to do it more often! How do you feel about wearing white? It’s all about the pins! This one has been a long time coming! 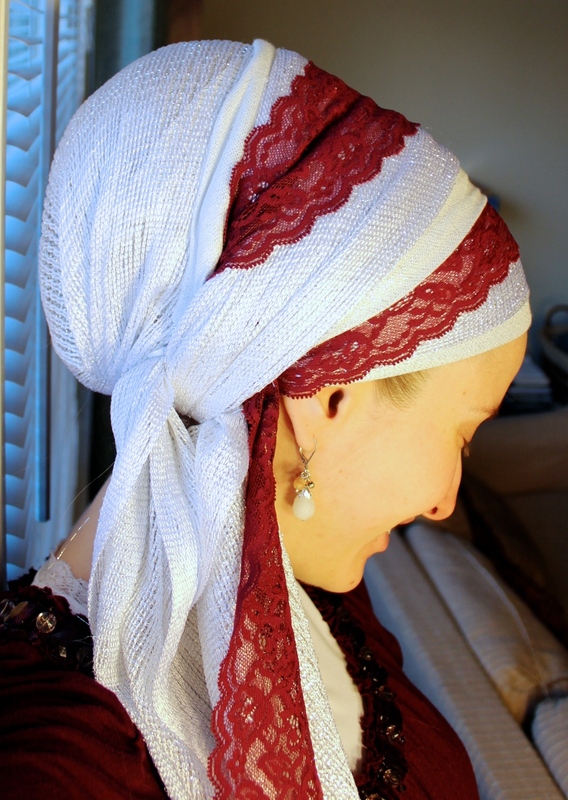 Finally, a tutorial all about putting pins into your tichel! Andddd what am I wearing on my head in the beginning/during the video? Sometimes it’s best to just stick to what you love, and today I decided to wear comforting tichels and an accessory that I just know is totally “me”. My favourite green pashmina, a gorgeous green sari sash, and the vintage beauty headband. Such a happy day to be wearing this! Lots of love, and happy pinning! Enjoy the tutorial!! Naomi Rose and Andrea Together! 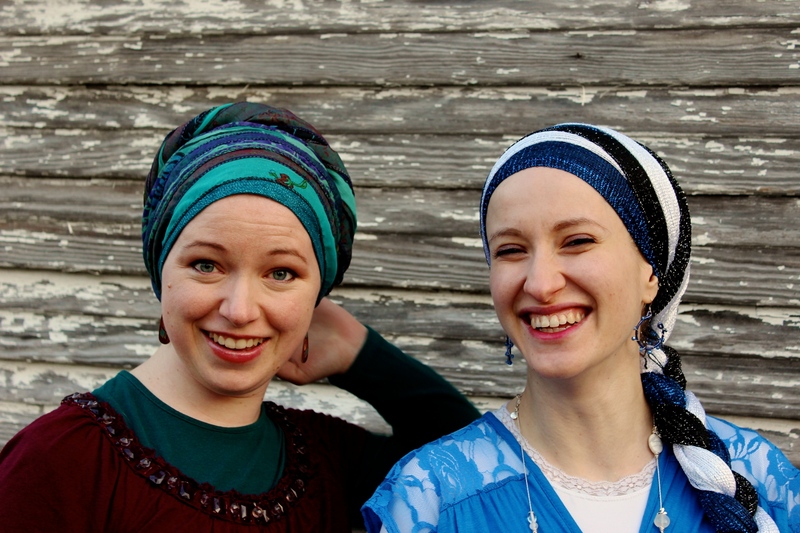 Look at our different face shapes and personalities, and how you can use your tichel to highlight these unique features and allow your inner essence to shine! Check out the gorgeous soft height on Naomi Rose, and the awesome shimmery-ness I’m wearing! No such thing as too many shimmeries… right? In the photo above, you can see how Naomi Rose has highlighted her beautiful face shape with a wrap that give height at the back and not the sides. And of course the teal and wine combo is just sumptuous! (She’s wearing a Trust and Sari Scarf.) I decided to go Shimmerycrazy with some side volume, angles (but not too angled because my face can’t take it!) and a side braid! Loved this! Now check out the next one we did! I decided that I wanted to try the height at the top too… but made sure that I extended it around the sides as well which worked beautifully! I really should wear this Lakeshore Bliss tichel more often! Naomi Rose looks ethereal and earthy in her Peaceful Mornings and Gold Roses headband tied in the Shira Tails style! Now honestly, both of us could have swapped styles and we still would have loved it, but the styles we wore during these particular photos reflected how we were feeling at the time, and what kind of light we wanted to give to the world! I’m so lucky to know this woman! 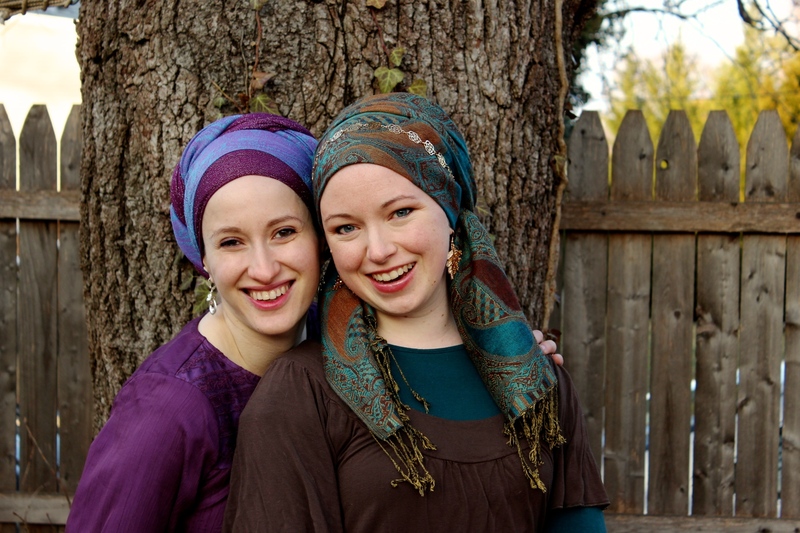 Wishing you all the bracha, beauty, and joy in the world! I am so moved by this beautiful article written about my story and the Wrapunzelution! This is from a paper in Lakewood NJ (Lakewood Shopper). Thank you Fradl for putting that which is so hard to talk about into words!